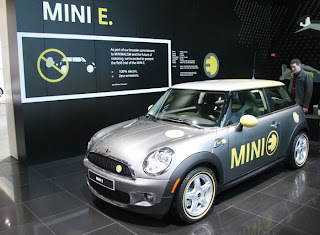 The MINI E is “an experiment of sorts”, according to MINI’s own website. 500 people were given the opportunity to lease a fully electric MINI E for $850/month for 12 months where the cars are undergoing a real-world experiment. The field trial was limited to only California, New York and New Jersey dealers. The idea of getting vehicles into consumers hands is an admirable one and one that will help BMW, who owns MINI, get a solid understanding of the challenges involved with supporting an electric vehicle (EV) product. Some wonder though if MINI rushed their experiment. BMW had to meet a hard date to obtain the important California Air Resources Board (CARB) credits earned from a Zero Emissions Vehicle (ZEV). To meet this date, it seems the vehicle wasn’t ready for primetime and some bad press has ensued around two key EV topics: vehicle mileage range and charging time. It was taking a full day for MINI E owners to charge their new cars due to some issues with the 120-volt cable that comes with the car. Estimated charging time was supposed to be in the 4-hour range. Estimated range on the vehicle was 156 miles when released, but MINI USA has been re-stating the range as 100 miles. Some owners are of course seeing lower or slightly higher mileage ranges, but well below the initial estimate of 156. Combined these issues were best summed up by an automotive enthusiast friend of mine, Mike Juergens, who commented, "they are like the RC cars I had growing up. I'd wait all day for it to charge to play with it for 10 minutes." There is some significant coverage of the MINI E in the blogsphere, especially when compared against a similar social media effort like Ford’s Fiesta Movement; though, the Fiesta Movement is more Twitter, YouTube and Facebook and less about blogging. The graph, at left, does show the MINI E is getting its message out in the blog community. With so much attention, the MINI E is an important test for all EV cars. It is a test to see how consumers enjoy them on a day-to-day basis and what issues may arise for all EV manufacturers. Releasing the car too soon to consumers is a gutsy move and one wonders if this trial will negatively impact the marketing of the MINI E going forward. One lesson MINI is sure to learn is that green vehicles need to be unique to be considered differentiating to the public. Even with some decals and other visual cues from a gas MINI, the new MINI E doesn’t scream look at me. One of the things I have found most interesting about the MINI E blogs out there are the number of owners concerned that the MINI E car itself is ignored. It isn’t the visual status symbol a Prius is. And considering that a MINI E is fully electric, it should be a level up in Green status from a hybrid car but no one is noticing the full electric merits of the car. So perhaps the first lesson is to make the car look entirely different than its gas counterpart.